A number of people have asked what the various columns on the pools mean, so I figured I'd put out a post explaining it all. Account and deadline should be pretty self-explanatory. The Share value is the percentage of how much you'll earn of the Current Block portion get if we mine this round. ~Reward is approximately how much you''ll get paid from the Current Round Portion portion if we mine this block. ~Capacity is an approximation of your plot size. If you use Blago's miner it will be acurately reported by the miner, otherwise it's estimated off your submissions. If you mine on multiple machines using Blago's miner, only the capacity of one of them will be reported. Share is the % of the historical portion you'll get if we mine this block. ~Reward is approximately how much you''ll get paid from the historical portion if we mine this block. When the pool mines a block you'll get paid the Total of the left hand and right hand rewards for your account, after 4 more rounds. The coin pays out 60% to the miners in the round we won, and 40% based on the historical value. The historical portion is based on your submissions for the last 50 rounds. The last or only number is the total amount of Burst you've earned from the pool. D - Burst earned but not yet paid out. Q - Burst queued to be paid out. U - Burst paid out, but not yet confirmed. Payouts occur when your balance is over 300, or your payments have been deferred for 360 rounds ~ 24 Hours. @haitch Why do neither pool show the stats pictured here anymore? @BTCTycoon The stats are still there, exactly like this. What are you seeing ? @haitch here is what I see on Fireforx. IE, chrome, and Tor looks fine for me. Just a problem with Firefox and I'm sure that has nothing to do with BURST. @FXALTareeq - must be a Firefox rendering issue - nothing on the pool code has changed, and as the other browsers are working fine it's somethings changed in FF. I couldn't get the stats to load properly with any browser. Tried IE, Chrome, FF, Safari on Ubuntu, Windows 10 & OSX 10.11 with no success. Turns out it was squid proxy on a pfsense router I was running. Oddly disabling the service wasn't sufficient, I had to completely remove the proxy server for it to work. Im mining with 963 GB and with the ninja pool. What color is the ninja pool and why can't I find my Burst name to find how much i'm making? Edit: or pool.burstcoin.de , pool.burstcoin.eu , pool.burstcoin.biz . @daWallet LMAO - Exactly. If you don't have 25TB+ use pool.burst-team.us. @haitch So do you need the minimum of 25 tb to mine on that website or so? @theapple0 Yeah, ninja only accepts short deadlines. If you don't have a significant amount of capacity you won't get submitted deadlines for many rounds. Switching to the burst-team pool allows you to submit longer deadlines and earn shares that you wouldn't get on ninja. 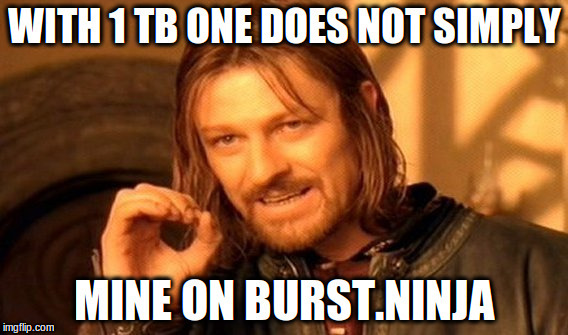 So the problem is I mined for like a half a day on the website with 0.3 tb but they still have my burst. Do they also have a penalty system or so? @theapple0 No penalty system, and your Burst will payout after approximately 24 hours if you stop mining there, so there is no loss in switching. pool.burstcoin.eu is working fine, but I just clicked on the link you just posted and it doesn't work for me. I'm sure someone will by soon with a solve for you. So until it is fixed i have to change to http://pool.burstcoin.eu/ if I don't want to lose earnings. Not really a good week for Burst. Lot of forks and now 2 big pools from the dev-team down. @piezo Solo Mining is always a possibility. But sometimes even your local wallet or computer crashes. It was a rough week for Burst - but some downtime of pools is part of the game and not to compare with the peering and forking issues we've solved.